Have you ever logged onto your Windows computer and the desktop is blank and none of your files or programs are showing. This usually only happens on older computers but it can happen at anytime. What happens is that when you booted up your computer it couldn't find the files for your Windows profile. This happens and is usually not a big deal. To fix it all you have to do is reboot the computer. Nine times out of ten this will work. What's scary is that one time that it doesn't work. If you reboot and your stuff still doesn't show up. Well then you need to do just a little bit to get yourself back up and running. First go to start, computer. Double click on the C drive and then go into the Users folder. Here you will see the folders for all the users on the computer. You should see the folder of your profile here. Go into it and then click into your Desktop folder. If you see everything from your desktop that is missing here then all of our files are safe and good to go. Now we just need to build you a new profile. Click the start button then on the icon for your user profile at the top of the start menu. That will take you to a menu that will look like this. Click the "Manage another account" link. At the bottom the next screen you will see a link that says create a new user account. Follow the steps through that to create your new user account. Now that you have made your new user account you need to move over all of your data from the corrupted account over to your new one. You need to open My Computer to get to your corrupted profiles files. Here is what you need to click on to get to your files. Now copy all of those folders into your clipboard. Ctrl+A will select them all and Ctrl+C will put them all in your clipboard. Good. Those files need to be pasted into your new profiles files to make them accessible again. Follow the same path I have above but go to your new user profile's folder instead of the corrupted on. 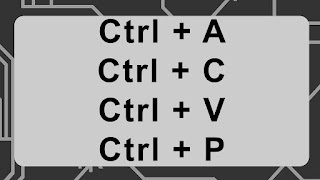 Use Ctrl+V to paste the folders in from your clipboard. Will ask you if you want to merge the folder and you say YES. Congratulations you have saved your files!!!!!!!! Some programs may need to be re-installed depending on the program and you will have to put some of your settings back such as your background image but you saved the important stuff. Nice job. If you have any questions at all please put them in the comments below.